Do the conventional insights of depth psychology have anything to offer the gay patient? Can contemporary psychoanalytic theory be used to make sense of gay identities in ways that are helpful rather than hurtful, respectful rather than retraumatizing? In Psychoanalytic Therapy and the Gay Man Jack Drescher addresses these very questions as he outlines a therapeutic approach to issues of sexual identity that is informed by traditional therapeutic goals (such as psychological integration and more authentic living) while still respecting, even honoring, variations in sexual orientation. Drescher's exploration of the subjectivities of gay men in psychoanalytic psychotherapy is more than a long-overdue corrective to the inadequate and often pathologizing tomes of traditional psychoanalytic writers. It is a vitally human testament to the richly varied inner experiences of gay men. Drescher does not assume that sexual orientation is the entire or even major focus of intensive psychotherapy. But he does argue, passionately and convincingly, that issues of sexual identity - which encompass a spectrum of possibilities for any gay man - must be addressed in an atmosphere of honest encounter that allows not only for exploration of conflict and dissociation but also for restitutive confirmation of the patient's right to be himself. 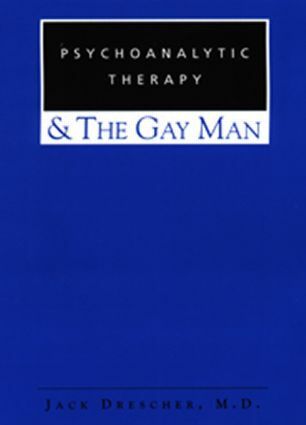 Through its abundance of first-person testimony from both clinical and literary sources, Psychoanalytic Therapy and the Gay Man provides the reader with an unforgettable grasp of what it is like to discover that one is gay in our society and then to find the courage and humanity to live with that knowledge. Any mental health professional - regardless of his or her sexual orientation - who wishes to deal therapeutically with gay men will find Drescher's work indispensable. But it will also be compelling reading for anyone seeking psychological insight into gay men's lives and concerns.